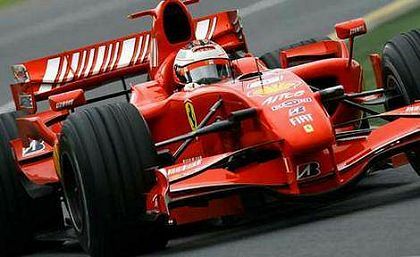 Kimi Raikkonen has been talking about his chances of success in this coming weekend's European GP at the Nurburgring. It's a pretty standard driver's interview, mentioning his previous bad luck at the circuit but hopeful of a change in fortune from now on. There is one thing different about it, however; it is rather more chatty than we are used to from Kimi. In fact, he probably says more than he has in all the season so far. Is this the first sign of a return on Ferrari's promise before he joined the team that we would see a more open Kimi this year? If so, it is probably also a reflection of Raikkonen's apparent breakthrough in getting to grips with his car. In the last two races he has seemed much more confident and at ease, the resulting victories adding to that impression. It may be that we have seen the turning point in his season and that his real challenge for the championship began at Magny Cours. Can he be champion this year? It is mathematically possible, of course, but there remains a considerable points gap for him to make up - 16 to be exact. All it will need is some bad luck for the leader, Lewis Hamilton, and that lead will evaporate, however. Hamilton is the only one of the four contenders not to have suffered problems so far and it is not impossible that his bad fortune awaits him in the second half of the year. Even without the interference of luck, I think Kimi's chances are good. Just as the Finn seems to have gained the upper hand in his struggle with his team mate, so has Alonso. If the world champion starts to beat Hamilton with regularity from now on, he will close his own points gap to the leader and become the main target for the others in the last few races. So Kimi really needs to be finishing ahead of Fernando and the recent form of the Ferrari would indicate that this is quite possible. The message is clear, therefore: don't write off Raikkonen. If he were competing against anyone other than Alonso, I would probably bet on the Finn myself. But Fernando makes the task a little bit more difficult - he's done it before, you see. There is something about winning championships that becomes habit-forming. And Alonso is the only one of the four contenders to have experienced that. Maybe it's luck or an extra helping of determination but the Spaniard has twice demonstrated that he can cope with close battles in the run-in to the championship and I expect this to make a difference in the forthcoming races. Much depends on any decisions made at next week's FIA hearing on the Ferrari documents matter, of course; if McLaren are docked points, all bets are off. But ignoring that, I would say that Alonso is still the most likely to claim this year's championship. Having watched Kimi at Magney Cours and Silverstone, especially with Silverstone it was like the Kimi of old, the unbelievably fast and outright brilliant Kimi. I was incredibly glad to see him pick up those two wins, one to get ahead of Massa in the championship to stop all of this crap about Massa being better, which in my opinion is just untrue. I always feel Kimi is a threat to the championship, for the first half of the season Kimi wasn't at his best at all but you consider he's the one to of the mechanical failure resulting in the biggest points loss he's suffered. He'd have 6 more points from that podium in Barcelon and look only 10 points off the lead. You can never rule out Kimi and personally I'd like to see him get this year's championship but of course there's that age old problem with Kimi, the luck. He has absolutely nothing of it, he lives without luck at all and it's frustrating to see it consistantly keep him down. It's ridicolous the number of mechanical failures he's suffered. The key factor for me will be whether his luck will hold out, as you need it in good preportions to be a world champion. Looking at it dispassionately, I have to say that Fernando still has the best chance. But I would never write Kimi off - I've seen him win through adversity too often in the past. Alonso's brilliance is obvious in that he's the twice world champion. However, I can't shake off the feeling that he's a bit of a 'blamer', faulting others for his failings. His fiery temperament and a possible inability to stay mellow when in an underdog position could make him stumble. Kimi, on the other hand, came from nowhere into contention time after time when driving for Alonso's current team. I'd wager had it been Alonso suffering the car failures that Kimi suffered in his McLaren, the marches forward would have been much less impressive. I agree that Alonso is a bit of a whiner at times, Rose, but it seems to me that he changes the moment you put him in a car. Last year he moaned about the Renault losing competitiveness and then went out and beat Michael with some extremely confident driving. He's an enigma in that way, apparently able to just get on with the job when he needs to. You are right, too, about Kimi being so good in adversity; in fact, I've wondered if that was the problem this year - that he needed to have more to fight against before really getting down to it. In comparing them, I think that Alonso's experience of gaining two championships may be the deciding factor, especially if the points tally is very close. As for Massa, I find him really difficult to evaluate. I saw the improvement in his driving last year when he was able to get on almost equal terms with Michael, and don't doubt that he can be very quick on occasion. Maybe it's his temperament that I worry about; he does seem to make mistakes when the pressure is on. Seeing as Kimi is on pole, I think he was quite justified in talking up his chances. Now we need to see whether the gap to second was done entirely through quality driving on Kimi's part or whether fuel load had an influence. Ah, the great imponderable, fuel load. One thing I have noticed this season, Alianora, is that we all guess that a driver's grid position is all down to a heavy or lighter fuel load; yet, when the race is run, hardly ever does it turn out that one driver has much more than a lap or two of fuel more or less than another - at the front end of the grid this has been true to a large extent. Certainly those few extra gallons can make a big difference in strategies but I think they have less influence on lap times than we have been giving them credit for. Good job and great battle for kimi, overall kimi still on top if compare to Alonso and Hamilton, with 2DNF he still have a chance for the championship title. the 2DNF make he lost full solid 20 championship points and if we add to available point there should be 104 point for kimi already. Good point about the 2 DNFs, Henky. But reliability has been the main problem with the Ferrari this year, hasn't it?